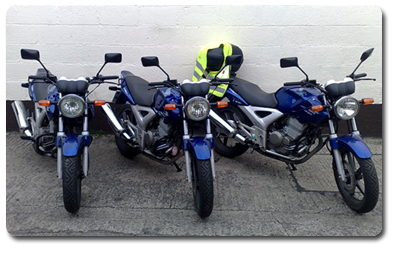 Churchtown and Raheny no longer conduct Motorcycle Tests I also cover Wicklow and Gorey Test Centres and bike hire is also availaible for these as well. The pre-test lesson is normally taken within 2 weeks of your test date in the locality of your test centre. This will give you a good knowledge of the possible test routes which your examiner may use and demonstrates how your examiner will expect you to ride during your test. I will explain how the test is marked. You will receive a clear understanding of how many mistakes you're allowed to make and the severity of those mistakes. You will also be given a copy of the Questions and Answers, also Road Signs will be shown for you to identify. I will give a full explanation on how the test is conducted followed by a demonstration ride around the possible test routes with radio commentary, so you will see and hear how you should ride. You will then ride out in front of me and with the use of radio contact I will give you directions as to where I want you to go exactly like your examiner. I'll correct your mistakes if you make them. This allows you to recognize your faults immediately and correct them. 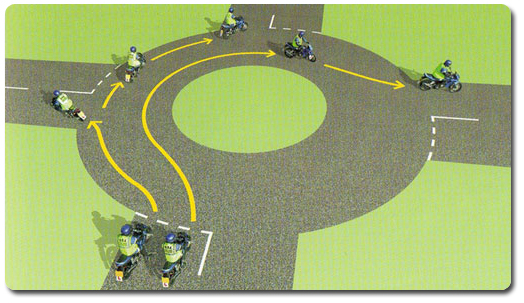 I will give you useful tips on how to perform a U-turn properly and how to ride your bike slowly as the examiner walks beside you. I'll also cover the braking exercise and the overtake manoeuvre around the examiners car. The examiners have a job to do. They are not out to fail you - be prepared for your test and you will pass. Avoid disappointment and book this course as soon as you receive your letter of test date notification especially if you require bike hire. 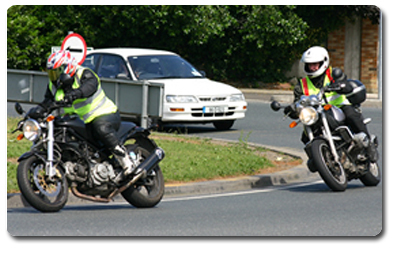 From 1 December 2007, motorcyclists with learner (or current provisional motorcycle driving licences) will be required to display L-plates on a yellow flourescent high visability tabard. (A tabard is a bib or sleeveless outer garment with open side-seams). The letter 'L' must be at least 15cm in heigh on a white background and must be to the front and rear of your torso. It will be a criminal offence for learner motorcyclists not to display L plates from that date. Tallaght,Finglas, Wicklow and Gorey. Churchtown, Rathgar and Raheny are closed for Bike tests. 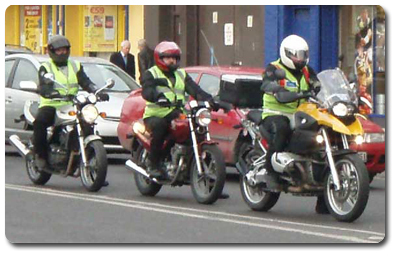 If you pass the test on a motorcycle up to and including 125cc then you will only receive a full A1 licence. This will not entitle you to ride a larger cc bike under that full licence. If you pass the test on a bike more than 150cc you will receive a full A licence which will entitle you to ride any cc bike that does not exceed a certain power for a period of two years. After two years, the restriction will automatically be lifted and you will be able to ride any motorcycle you choose. Both these tests are identical. It is advisable however, if you're over 18 years old to sit the test on a 250cc or larger cc manual bike as you will not have to take the same test again. If you pass the test on an automatic twist 'n' go bike then you will have a restriction placed on your licence, this will not entitle you to ride a manual bike under that full licence. If you do decide to move to a manual bike then you will have to sit the same test again on a manual bike.